Mercury's subsidiary label Limelight, being famous for a series of LPs of Jazz, electronic and experimental music, also had 45rpm single releases. 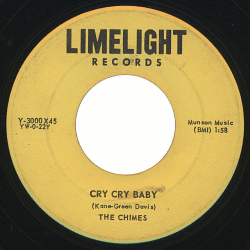 Surprisingly, a series of Limelight 45rpm releases contain totally different kinds of music compared with LP releases - 1000 Series, 2000 Series and 3000-3005 are Rockabilly and Doo-Wop; 3006-3041 are Garage/Surf Rock music - which totally breaks our stereotypes of the Limelight label. BTW later 45rpms from 3050 and beyond are single cuts from ordinary LP releases (with a few exceptions). Please note that all materials of 1000/2000 series and 3001-3005 were recorded in around 1957. Also, we can see their matrix imprints are famous type pressed at the RCA Victor Indianapolis plant. This may prove that these platters were pressed at that time (at least in the late 1950s), and that the Limelight label itself had existed since the late 1950s - which is really surprising. L-3087 ??? c/w ??? Electronic Concept Orchestra - UNRELEASED? visitors to this page since June 19, 2004.